Bone density scanning, also called dual-energy x-ray absorptiometry (DXA or DEXA) or bone densitometry, is an enhanced form of x-ray technology that is used to measure bone loss. To accurately detect osteoporosis, doctors commonly use DEXA bone densitometry to measure bone mineral density (BMD). The bone density examination is a method use to determine how much mineral is in a person’s bones. This number can then be compared to a similar reference population to determine whether a patient has osteoporosis. Osteoporosis is a disease of low bone mineral content and could result in the development of fractures with little or no trauma. Once the bone density is determined, the value is converted into a score that reflects the relative risk of osteoporosis and the risk of sustaining fractures. This “T-score” can be used to assess the relative risk of future fracture and also be used to monitor a person’s response to therapy. At Peninsula Imaging we also use software with your DEXA scan called FRAX which has been developed to assess the probability of a fracture. With the implementation of FRAX, your physician can actually evaluate the 10-year probability of having a hip fracture or a major osteoporotic fracture. You will be asked to remove some or all of your clothes and to wear a gown during the exam. You may eat normally, but do not take any calcium supplements or multi-vitamins for at least 24 hours prior to your test. Inform the technologist if you have recently had a barium examination or have been injected with a contrast material for CT or radioisotope scan or if there is a possibility that you may be pregnant. There are different methods of determining bone density. Peninsula Imaging utilizes DEXA scanning (Dual-Energy X-ray Absorptiometry) which is considered to be the best method available. The DEXA examination takes about 30 minutes. The patient rests, without moving, on a padded table while a small arm-like device passes over the patient. It is important that you remain as still as possible during the procedure to ensure a clear and useful image. Spine – during an examination of the spine, your legs will be supported on a padded box to flatten your pelvis and lower (lumbar) spine. Hip – the technologist will place your foot in a brace that rotates the hip inward. In the event we can not do a hip or spine (surgery), we will perform a forearm of the non-dominant side. What does my T score and Z score mean? This number shows the amount of bone you have compared to a young adult of the same gender with peak bone mass. A score above -1 is considered normal. A score between -1 and -2.5 is classified as osteopenia, the first stage of bone loss. 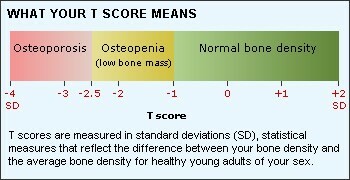 A score below -2.5 is defined as osteoporosis. It is used to estimate your risk of developing a fracture. This number reflects the amount of bone you have compared to other people in your age group and of the same size, race, and gender. If it is unusually high or low, it may indicate a need for further medical tests.